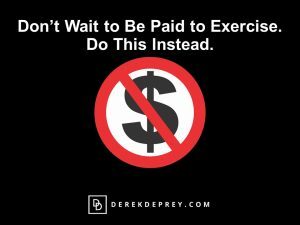 Derek Deprey | Don’t Wait to Be Paid to Exercise. Do This Instead. 17 Jan Don’t Wait to Be Paid to Exercise. Do This Instead. Are We Ever NOT Busy Anymore? While “tax season” does technically come to an end, will you then be likely to be on to the next time consuming thing? We are seemingly busy year-round. For example, I know teachers who instruct summer school classes during their “three months off.” I know business owners who are terribly busy during the Christmas season, but then immediately following their “busy season” they remain almost just as busy trying to catch up on what was put aside during the holiday rush. 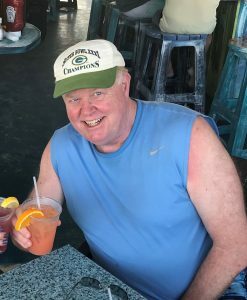 When I worked in college athletics, we recruited talent and ran basketball camps during our “off-season.” How about you? Do you have an off-season? What I found interesting is that both accountants receive some sort of corporate wellness reimbursement. Their habits, however, are completely opposite. Are you incentivized by your employer to work out? Are they willing to pay for your gym membership? If they are, are the incentives actually motivating you? A study by the National Bureau of Economic Research found that being paid to exercise doesn’t necessarily change anyone’s habits. Apparently, you can’t even pay people to go to the gym. We are in the most incentivized era of the health and fitness industry, yet according to a 2018 International Health, Racquet & Sportsclub Association (IHRSA) report, only 19 percent of the U.S. population belongs to a health club… roughly the same market penetration as 10 years ago. As a club member for over 30 years and club operator for over 10 years, I’ve watched the behaviors of thousands and thousands of gym goers. From my observations, most of the people who consistently exercise don’t wait for a “no joining fee” or “free month” flavor of the day. Additionally, most of them don’t need a health insurance gym reimbursement or a corporate wellness program. There is more to it. Don’t get me wrong, exercisers appreciate the carrots, but they first choose to make the time and sacrifice for themselves over and over again… not the other way around. They choose to make fitness a part of their day. Are you willing to make the time and sacrifice, like my friend Steve? Just because you’re not working every hour of the day doesn’t mean you’re not working hard. Fitness people choose to go to bed early, so that they can be the first ones at cycling class in the morning. They choose to eat lunch on the fly, so that they can get on an elliptical in their corporate fitness center during the designated lunch hour. They choose to lift weights at the gym right after work before they go home to eat pizza and watch Netflix. They choose to run on a treadmill in their basement after their kids go to bed. They don’t make excuses because they know they’ll have more energy and perform better after physical activity. 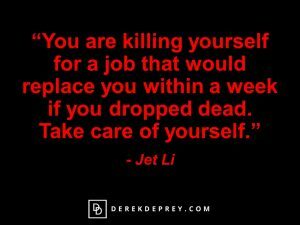 Chinese actor Jet Li offers this insight into most people’s reality, “You are killing yourself for a job that would replace you within a week if you dropped dead. Take care of yourself.” Stop waiting to get motivated. Stop blaming your boss. Stop binging on your screens. Stop being too busy. You can escape a lot of things, but you can’t escape the effects of stress and neglect on your body. Build a life where you can get work done and stay healthy at the same time… even during your busiest season. Stay tuned! My next article will be about cultural barriers that prevent people from fully engaging in wellness, including employer’s lack of support… as well as ways that you can help to improve the wellness environment at your organization. ACTION: Stop waiting until after the New Year… after the Super Bowl… after the weekend. First, make the time. Guarantee your workouts by blocking off the same day and time every day. Then, make the sacrifice. Don’t cancel these appointments with yourself. Make yourself your most important commitment of the day.